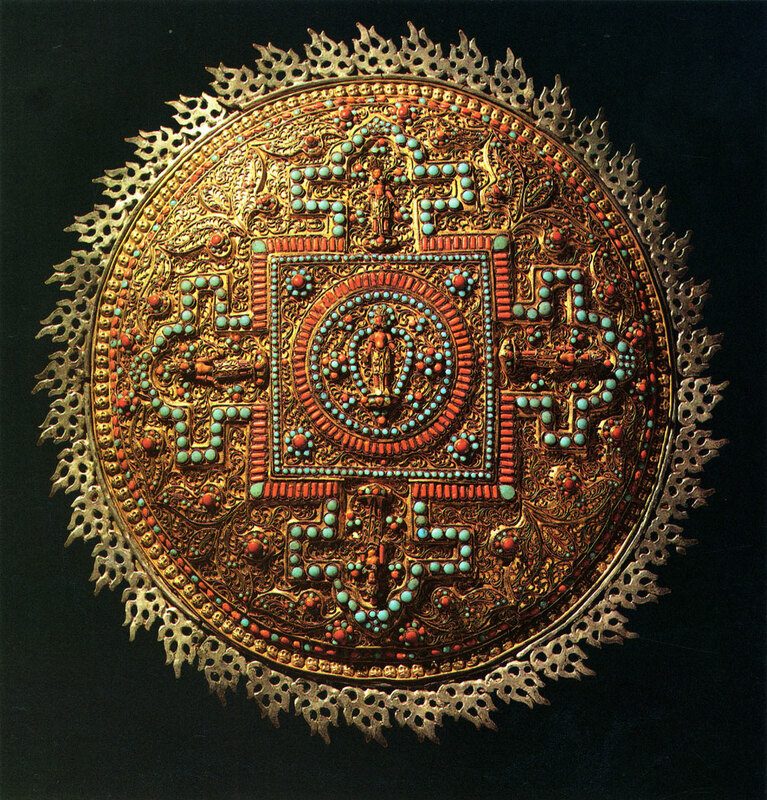 Brass, with coral and turquoise inlays and filigree work. Received in 1969 from the Board of Art Exhibitions and Panoramas attached to the USSR Ministry of Culture, Moscow. First publication. The mandala is a mystic symbol of the universe that is typically in the form of a circle enclosing a square and often bearing symmetrically arranged representations of deities. It is used chiefly in Hinduism and Buddhism as an aid to meditation. The mandala reproduced here is designed on a simplified pattern which contains only two basic elements : a circle (the shape of the plate itself) and a square with arch-shaped openings on each side: these symbolize the four parts of the world. The central deity and its four counterparts on the sides are practically indistinguishable, and their identification is impossible because of the absence of any attributes. Such a simplified treatment virtually deprives the mandala of its symbolic implications and brings its purely decorative aspect to the fore. The article catches the eye with its golden sheen of brass, intricate filigree ornamentation and colourful inlaid pattern. It matches the lavish decor of the ornate interior of a Buddhist temple. Brass, tinned (? ), embossed and engraved. Received in 1935 from the Museum of Ethnology, Moscow. First publication. The vessel is a type of ritual religious ware. 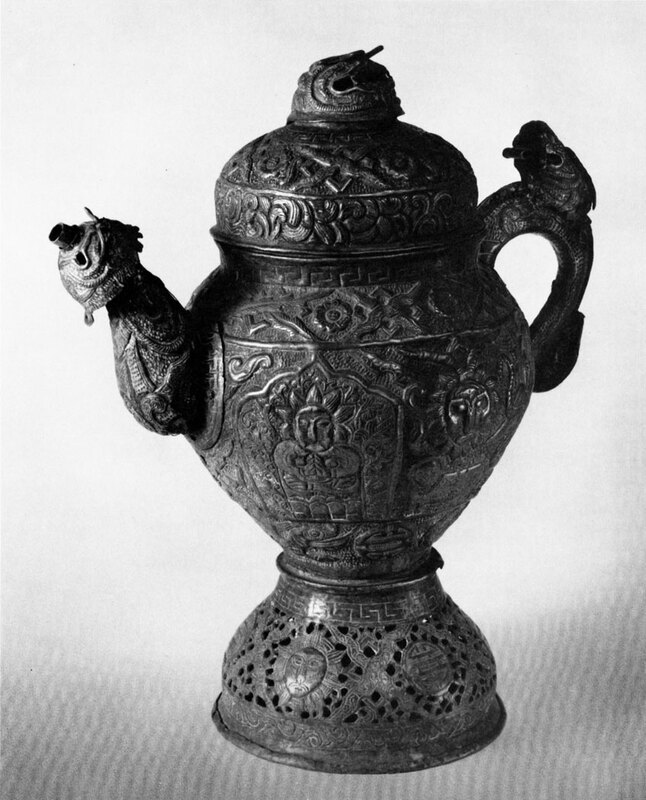 Its shape is similar to that of a samovar. Inside the vessel there is a cylindrical container for the coals. It is provided with two lids-one for the water reservoir, the other for the coal container (the larger and smaller lids respectively). The embossed ornamentation on the body and on the base of the vessel is arranged in bands. The middle band represents solar symbols: anthropomorphic masks surrounded by flames, the Garuda bird and a lion. The lower band on the body is decorated with the figures of Makara, a fantastic creature with a crocodile's body and an elephant's trunk. Makara symbolizes water as one of the four elements. Maskey belongs to the eldest generation of contemporary Nepalese painters. His artistic career started in the 1920s. This was the time when Nepalese artists began to assimilate Western European ideas, which eventually stimulated the development of national secular painting and the appearance of new subjects and genres. Chandra M. S. Maskey's paintings portray scenes of everyday life, local customs and traditional holidays. The principal characters in the painting Wedding Ceremony-the bride and the wedding-guests who came to greet her-are placed in the foreground. The artist gives great attention to the postures, gestures and costumes of his characters, to various attributes of the scene and to the architectural background of the picture: the brick wall, the carved wooden shutters and platbands of the windows and the painting of the portal all are rendered with a great precision of detail. Another favourite genre of Chandra M. S. Maskey is landscape, townscape in particular.